Was born at Sulby. Both his parents and grandparents were of ordinary stature, and he had numerous brothers and sisters, none of whom were remarkable for their height. At the age of 22 he was 7ft. 6in., and weighed 21 stone, and it is said that he grew slightly after that age. He was well built and so strong that he could lift a sack of flour with one hand and toss it into a cart. Early in 1852 he went to London, where he was exhibited. Soon afterwards he was engaged for exhibition in Paris for twelve months. It is said that the sumptuous living he indulged in that capital had such a bad effect upon him that he died of surfeit. The man who engaged him had insured his life for £2,000. Here it seems A.W.Moore was wrong - a more complete biography is given in Journal Manx Museum. John-Thomas  Jane Patrick William Margaret  Eleanor  Simon-Peter Maria Christian Arthur-James  Cath. A.W.Moore's version based on account in Manx Sun 15 Jan 1853 plus a following letter confirming story 12 Mar 1853 from Anne Caley. 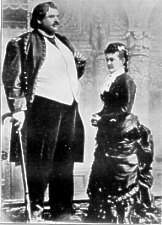 The original story of his death in Paris would appear to have been fabricated by Etienne Lefevre and Arthur went to join his sister Margaret Gelling in America where he appeared for Barnum and Bailey as Colonel.Ruth Goshen (or Goshon). The Manx Sun of 9 Mar 1889 picking up on an article in the New York Sun headlined a small paragraph 'A Manx(?) Giant's Funeral' - possibly this is where LaMothe picked up his story though Serjeant did not appear to have been aware of his comments. Possibly the 'wife' in LaMothes photo is his sister Margaret though Arthur had an adopted daughter Frances. Goshen occurs in the Biblical account of Joseph's stay in Eygpt - Harrison here comments that the Land of Goshen was equated with the land of plenty - in a gloss on the story of Arthur Caley (Manx Millenium 2000AD pt 8 August 1999, & pt 9 Sept 1999) Terry Cringle credits George Broderick with pointing out that there were two Goshen fields in Sulby between St Judes and Sulby Bridge close to where Arthur came from.